OurEnergyPolicy.org | The Water-Energy Nexus: How Can Collaboration Lead to Greater Impact? This prompt is the second in a series of discussions led by invited speakers at the upcoming 15th National Conference and Global Forum on Science, Policy and the Environment: Energy and Climate Change to be held January 27-29, 2015 in Washington, DC. Energy and water systems have historically been designed and managed independently. However, the systems are, in fact, interdependent. In its simplest form, the energy-water nexus can be broken into two parts: “energy for water” —the energy required to treat, transport, or heat water—and “water for energy” —the water required for cooling thermoelectric power plants, oil and gas production, hydropower, and bioenergy feedstocks. In the future, the relationship between energy and water systems will evolve, driven by changing energy portfolios and technologies, changing precipitation and temperature patterns, and population growth and migration. An integrated approach to addressing complex energy-water nexus issues can benefit from technology, policy, data, modeling, and analysis elements. A range of stakeholders can play an important role, including federal/state/tribal/local governments, private industry, NGOs, international organizations, foreign governments, academic institutions, utilities, and citizens. 1) What are the key elements that would distinguish such an integrated approach from a traditional approach? 2) How are goals, priorities, and supporting actions best identified and pursued? 3) Who are the key stakeholders, and what are their optimal roles? • Department of Energy, The Water-Energy Nexus: Challenges and Opportunities, U.S. Department of Energy Water-Energy Tech Team, June 2014. • Water in the West, Water and Energy Nexus: A Literature Review, Stanford University Woods Institute for the Environment and Stanford University Bill Lane Center for the American West, September 2013. • World Bank, Thirsty Energy, Washington D.C., January 2013. 1) What are the key elements that would distinguish such an integrated approach from a traditional approach? 2) How are goals, priorities, and supporting actions best identified and pursued? 3) Who are the key stakeholders, and what are their optimal roles? 12 Responses to The Water-Energy Nexus: How Can Collaboration Lead to Greater Impact? You are correct in your focus on pumped hydro, but only if we are to move toward a low carbon emission electric power supply. The alternative carbon free renewable sources of power generation are limited by their unreliable operating characteristics. Wind and solar can only achieve 20% to 35% annual capacity factors; and so must be supported by reliable gas turbine generators to keep the lights on.. Of course, this also provides a great market for energy storage to cover the periods when wind and solar are unavailable. The problem is that wwe cannot find many suitable sites for pumped hydro or air storage capacity. Other storage schemes are not yet close to capable of meeting the demand. We should also recognize that power generation plants, including conventional steam (rankine cycle) as well as gas turbine (brayton cycle) plants can be, and have been designed to operate with dry cooling systems. The operating cost penalty for steam plants can range up to 10%, to maybe 15% deepending on location and operating requirements. The operating penalty for simple (Brayton) cycle gas turbine plants is relatively insignificant. The aircraft jet engine is a good example. In summary, conventional power generation plants need not rely on water for cooling. It is a matter of economics. Someone has to cover the increasaed capital and operating costs. Maybe as much as 20% rate increase? I am very glad to see DOE linking the use of extractive energy generation and water as a criteria for future investment planning. To me there is only one conclusion for action … transition to wind and distributed renewables as soon as possible. 30% generation with no grid issues is possible by 2030, closing the equivalent old coal and nuclear generators, saving water as well as the climate and our air resources. Retrofitting buildings can reduce demand, providing for any projected increase of electricity demand according to many studies. Expanding electric and hybrid cars use would also be a 2 for 1 win. 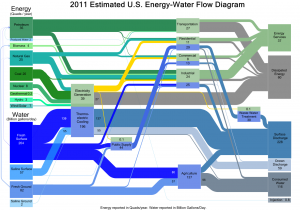 The Union of Concerned Scientists – has a good study of the intersection of water and energy. Here is a summary of the facts they set out in a way that is easy to wrap your mind around. •	One load of hot-water laundry (using electric appliances), requires 3 to 10 times more water at a nuclear or coal plant to produce the electricity needed to wash the clothes. •	a typical 600-megawatt coal-fired power plant consumes and evaporates more than 2 billion gallons of water per year from nearby lakes, rivers, aquifers, or oceans. In the southeastern United States, power plants account for two-thirds of all withdrawals of freshwater. •	Roughly 1/3 of all U.S. power plants use once-through cooling, and so return virtually all the water they withdraw, however it is returned 17 degrees hotter than when withdrawn. Half of all coal plants report releasing water in the summer at peak temperatures of 100°F or more. Not good for the fish! •	Creating a single gallon of ethanol consumes, on average, about 100 gallons of freshwater. Electric cars are cheaper and cleaner. •	Strip mining of coal by mountaintop removal has buried almost 2,000 miles of Appalachian headwater streams—some of the most biologically diverse streams in the country. •	The arsenic, mercury, lead, and other toxic substances contained in the 120 million tons of coal plant waste produced every year can severely contaminate drinking water supplies. There is no good way to dispose of this waste. One Energy co. says removal of coal ash ponds could take 30 years, cost $10b. Most coal ash ponds are old and unlined and sited by rivers. •	The process known as hydraulic fracturing that produces oil and gas can potentially lower local water quality, as well as strain local water supplies. Each well requires 2-10million gallons of water and 4 million pounds of sand. One Texas town was pumped dry. •	38% of the areas where shale gas and oil is most abundant is arid or already under severe water stress according to the World Resources Institute. The wells should not be approved in those dry areas. •	more than 2,500 small earthquakes that have hit Oklahoma in the past five years They can be linked to fracking wastewater injection. Other stidies are underway. •	Neither EPA nor states monitor groundwater quality over time to detect contamination from Class II wells. Resources are limited for any kind of monitoring and enforcement for water and air pollution. A new study by Center for Biological Diversity shows coastal fracking in CA is unique because CA’s coastal fracking occurs at shallower depths and with higher concentrations of chemicals than in other areas. •	Increased earthquake risk linked to fracking and the injection of fracking wastewater into disposal wells. We no longer have to rely on extractive energy. As we transition to a new, largely distributed structure for our el should be required to look at the water/GHG nexus to limit our long-term investments. I have prepared a “Gallery of Clean Energy Inventions” exhibit. See https://app.box.com/CLEANENERGYEXHIBIT. Its seven separate exhibits comprise of 41 new types of generators, 16 “Advanced Self-Powered Electric Vehicles” innovations, 25 radioactivity neutralization methods, 22 space travel innovations, 10 technical solutions to water shortages, and torsion field school network. These inventions are so radical that some may require tens of millions of dollars each to fully exploit. $1 billion would establish a comprehensive proactive clean energy inventions evaluation and development organization headquartered in Nevada. Divisions would include Board of Directors, Corporate Library, Consultants, Teaching Institute, Technical Evaluation and Advisory Board, and Incubator of Russian and Ukrainian Inventions. Speaking of the nexus of energy and water, seven of the ten “Technical Solutions to Water Shortages” rely on cheap or even free energy or electricity for enhancing the practicality of their respective water sources. There is water in combusted fossil fuel exhaust, and this distilled water is very usable. Industry and large commercial buildings consume a lot of natural gas for building space heating or to heat domestic or process water. In the process of consuming this natural gas efficiently with the technology of Condensing Flue Gas Heat Recovery, this water will be created. In every 1 lb of combusted natural gas there are 2 lbs of recoverable water. There are no shortages of proposed pumped storage projects. http://www.ferc.gov/industries/hydropower/gen-info/licensing/pump-storage.asp. While gas plants are flexible, they can’t absorb energy using water in oversupply situations such as with wind in the Northwest or the “duck curve” in California with regards to solar. The integrated energy-water planning problem for the U.S. is a very complex issue that warrants a comprehensive mathematical/computer modeling approach to properly understand the overall impacts of different policy options. In the 1970’s and 1980’s, I worked on developing integrated mathematical models to understand the interactions of supply and demand for energy in North America, and to assess key policy options. Similar models should now be developed for integrated analysis of supply and demand for energy and water over time. Such models could be regional (e.g. for the U.S. Southwest), national, or for North America as a whole. There are different methods to increase water supply, such as transporting water from water-rich regions to water-poor regions, and desalination of ocean water (a high-cost backstop technology). The demand for water, like the demand for energy, will depend on its price, and shortages of water supply will be reflected by a higher price (as is always the case in market economic systems). Higher-priced water will lead to less use and water-conservation policies being implemented. Econometric models of water demand need to be built that include the estimated price-elasticities of demand for water over time. A multi-period linear programming model that minimizes the costs of overall energy and water supply (considering costs of supply technological options and constraints on energy and water supplies in each period) could be integrated with a multi-period econometric model of demand for energy and water, at consistent prices over time. See http://www.jstor.org/discover/10.2307/170225 for our dynamic equilibrium energy modeling methodology developed for the BALANCE Canadian energy model. The resulting “shadow prices” in the model for meeting an incremental unit of demand for energy or water in a time period would be good estimates of efficient market prices. Such integrated supply/demand models for energy and water will of course depend on good estimates of water supply costs, price-responsiveness of demand, and interaction effects between energy and water (e.g. how much water is needed for natural gas fracking or different types of power plants, how much electricity is needed to transport water), and the sensitivities of the model results to these parameters can be examined. Environmental constraints on global warming greenhouse gas emissions should be included in the models. It would also be important to estimate the costs of preventing water contamination from fracking and coal use. The building of such integrated energy-water supply/demand models would be the best way to understand the interaction of various supply technologies and policy options on the overall costs of supplying energy and water to meet projected future demand. Policy options could include: raising the price of water to consumers, instituting water-conservation approaches, requiring specified greenhouse gas and other environmental standards to be met, or developing new national and international water transportation systems. Using the integrated mathematical model of the energy-water engineering/economic system, the various policy options could be investigated in an objective and consistent overall framework to derive the most economically-effective long-run solution. This would be an illuminating approach for the various stakeholders, including energy producers, water supply companies, energy and water consumers, and local/state/federal government policy makers, to assess the impacts of proposed policy choices on a range of criteria of interest. The Department of Energy’s report Water-Energy Nexus: Challenges and Opportunities, U.S. Department of Energy Water-Energy Tech Team, of June 2014 identified the key challenge: Federal oversight and administration of water management guidelines is shared across approximately 30 agencies in 10 different departments. Similarly, federal funding for water is split across many agencies, with no single agency ultimately responsible for the impact of multiple contributors (e.g., agriculture, development, and energy) to water management. Highly fragmented authority in managing the country‘s water has presented challenges in improving water quality in many parts of the country. Wet cooling of turbine exhaust steam at thermal power plants is the largest consumptive use of fresh water. Each kWh of electricity evaporates 1.8 liters of fresh water into the atmosphere. All that latent heat goes to waste, resulting in low fuel efficiency (heat rate). ARPA-E recognizes the importance of water issues in power generation and has called for submissions to improve dry cooling, as an alternative to wet cooling, in order that thermal power plants (coal and nuclear) achieve the goal of cooling with no net water dissipation. Applications in ARPA-E eXCHANGE (http://arpa-e-foa.energy.gov). The deadline for submission of Full Applications is 5 PM Eastern Time on February 13, 2015. The call for solutions is overly prescriptive, however, apparently limited to directly improving air cooling (Category 1) and supplemental cooling or cold storage (Category 2). Air cooling is too weak (<1 W/cm2, even with blowers) to handle the huge heat flux in power generation. Air cooling at data centers is a challenge, and they are better funded than coal plants. The path to net zero water dissipation must involve reducing the size of the job of heat rejection to a scale that air cooling can handle. That is possible by making wet steam do work before going to the condenser, which has the collateral benefit of improving the heat rate. We have serious water supply and access problem that will only be exacerbated by increased energy exploration and use, changes in climate, land use stresses, waste and inefficiency in the water and energy systems, poor pricing guidelines and practices, and end use waste including lack of recycling. The net result is that 99.7% of all the water on earth is not available for human and animal consumption. Of the remaining 0.3%, much is inaccessible due to unreachable locations and depths, and the vast majority of water for human and animal consumption, much less than 1% of the total supply, is stored in ground water. •Experts do agree: Demand is greater than supply. And 36 states face water shortages in the next three years. Every day Arizona and parts of New Mexico use 300 million gallons more than they get in renewable supply. The extra comes from underground supplies which are not renewable. Top four water uses in USA, according to USGS is (in millions of gallons per day) 143,000 for thermoelectric, 130,140 for irrigation and livestock, and 44,200 for public supply and 19,310 for mining and industrial (of which half relates to energy resources), which leaes 16,000 for all other uses of water. For every ton of coal from 800-3,000 gallons of water is used for extraction, transport, store, process and disposal, and the US uses 1 billion tons of coals per year. This report has been prepared in response to a letter to the Secretary of Energy from the chairmen and ranking members of the House and Senate Subcommittees on Energy and Water Development Appropriations, dated December 9, 2004, wherein they asked for: “a report to Congress on the interdependency of energy and water focusing on threats to national energy production resulting from limited water supplies, utilizing where possible the multi-laboratory Energy-Water Nexus Committee.” ACEEE reort. “We Can’t Have Water Without Energy, But How Much Energy Do We Need?” by Rachel Young, National Policy Research Analyst” shows (kwh/million gallons) shows 14,000 for wate source conveyance, 16,000 for treatment, 2,000 for distribution, 4,000 for wastewater treatment, and 2,000 wastewater discharge. US General Accounting Office ENERGY & WATER NEXUS published in December 2012 concluded that thermoelectric power plants use a fuel source—for example, coal, natural gas, nuclear material such as uranium —to boil water to produce steam. The steam turns a turbine connected to a generator to produce electricity. Production of oil shale requires the heating of rock containing solid organic matter to between 650 and 1000 degrees Fahrenheit and injecting water into the formation to stimulate the oil to flow. To date, there has been no commercial production of oil shale resources, in part, because the energy requirements to heat the rock and the water needed to stimulate the flow of oil make the process too costly to compete with other sources of oil. However, according to the U.S. Geological Survey, in terms of water withdrawal, thermoelectric power was the largest source of water withdrawals (49 percent) in 2005, followed by irrigation at 31 percent. Water withdrawal refers to water removed from the ground or diverted from a surface water source, such as an ocean, river, or lake. A recent World Bank report stated that water will become the natural resource most likely to cause armed conflict in the 21st century. Continual water shortages affect some 40 per cent of the world’s population in 80 countries and, given the rapid expansion of the population and ever-increasing demand for water, the situation is expected to deteriorate further. Whereas shortage of land once stood out as the main constraint on food production in the developing world, it is now water scarcity that will constitute the major challenge. Global demand for water is currently increasing at 2.3 per cent a year, doubling every 21 years, and supply can no longer keep up with the growth rate. Sadly, just like climate change issues, political systems our not suited to resolve these problems until they are in crises mode. Sadly, we are beginning to enter the crises mode. Some very insightful comments have been made. Herein lies the challenge: water use for wet cooling constitutes the greatest use of water in power generation. While most new power plants use recirculating cooling systems (see EIA’s data), retrofitting existing steam-electric power plants with recirculating systems is difficult, expensive and impossible in some locations. This issue has been studied at length by the Electric Power Research Institute (EPRI). Dry cooling is only feasible where the heat load is relatively low or the ambient temperature is sufficiently low. Rarely can it be used on boiler-based units in hot climates. Besides solar and wind, natural gas reciprocating engine power plants use very little to no water and are being built in hot, arid climates where water resources are scarce. In these cases, a requirement of the bid (plant design and operation) is very low water use. How that is accomplished in the U.S. speaks directly to Lisa’s comment, which is very pertinent: how is water use and energy planning coordinated among the various federal agencies? I believe DOE’s role is to 1) identify the issues with reducing water use for energy (and vice versa); 2) develop research priorities for reducing water use and 3) make policy recommendations for including water use as a constraint for energy production. Henry’s suggestion that modeling accounts for water use is an excellent idea for planning purposes (modeling is usually restricted to electric transmission constraints). That could be an extremely helpful tool for planning capacity additions and unit retirements. Over time through retirement of older once-through cooled units and greater deployment of renewables and distributed resources, the energy system will decrease water use. States with water scarcity where droughts have threatened electric power supply (California a good recent example) must look at water use in their permitting process and could codify that into state statutes. In this regard, I see states as having primacy in leading the push for lowering water use. A key element to an integrated policy approach for energy and water will be equal effort to develop – or promote – integrated regulation that can help balance the tradeoffs inherent in trying to achieve multi-sector goals. This will also require an overhaul of regulatory approaches and frameworks that are aligned with forward-looking policy goals that assume interconnectedness instead of existing separated approaches that keep regulators (and by extension, service providers) straight-jacketed in trying to meet antiquated metrics and standards. For example, regulation can help focus on simultaneous standards of efficiency and intensity by setting strict metrics on something like non-revenue water, which would help with conservation efforts while also reducing the level of energy needed for systems pumps, etc. While this is developed, solutions like the ones already discussed here – vigorous pursuit of renewable energy at both the utility- and distributed-generation scale, streamlining and aligning various agencies and departments that fight for resources or carry out conflicting mandates, financially penalizing wasteful patterns – should be supported to help overcome inertia. Another key element is educating consumers. Most likely see energy and water challenges as separate. Consumer-level technology can provide some inspiration. As “the internet of things” continues to develop, more and more consumers are receiving alerts, messages, data and other information about a host of things: their electricity consumption, their diet, their health, etc. In pursuing long-term goals, it will be important to find ways to get integrated information in front of stakeholders at all levels — consumers, building managers, city councils, state governments, — regarding metrics that show how much water was used to help provide the electricity they use and how much energy was used to provide the water they consumed. Provide benchmarks, help establish consumption reduction goals and keep them engaged in the process.